Marmota est genus Sciuridarum cui sunt quindecim species, aliis montes, aliis campos per orbem terrarum incolentibus. Plerumque in cuniculis habitant, et per hiemem hibernant. Pleraeque facile congregantur, et magnis sibilis signa inter se communicantur, praecipue quandocumque terrentur. Plerumque herbas, gramina, bacas, lichenes, muscos, radices, floresque edunt. Hic est index omnium Marmotarum a Thorington et Hoffman agnotarum, M. kastschenkoi nuper definitá additá, qui eas in duo subgenera dividuntur. ↑ Thorington, R. W., Jr., et R. S. Hoffman, "Family Sciuridae," in Mammal Species of the World: A Taxonomic and Geographic Reference, ed. D. E. Wilson et D. M. Reederpp (Baltimorae: Johns Hopkins University Press, 2005), 754–818. ↑ Brandler, OV (2003). 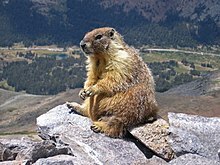 "On species status of the forest-steppe marmot Marmota kastschenkoi (Rodentia, Marmotinae)". Zoologičeskij žurnal 82 (12): 1498–1505 . Vicimedia Communia plura habent quae ad Marmotam spectant. Novissima mutatio die 12 Aprilis 2017 hora 12:10 facta.